The international event-level European football Championship prepares for conducting such events side of a number of requirements, which satisfy without attraction of high technologies is simply impossible. How to ensure the communication of equality of all guests of the championship - in terms of equal opportunities of communication with representatives of law enforcement bodies, for example? Language Communicator iTravl EURO 2012 ЕСТАСО helps Ukrainian police in solving these problems. Similar devices from the same manufacturer managed to establish themselves in the course of other international events, such as the Beijing Olympics 2008. 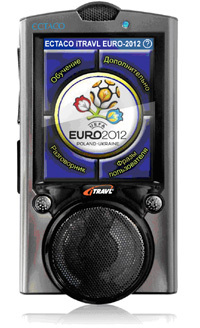 In versions EURO-2012 translator supports English, Spanish, Italian, German, Polish, Portuguese and French languages; recognizes the speech of the interlocutor and produces a translation of the response phrase in the language, «uttering words with the help of the built-in voice synthesizer. Provided «command mode» to feed the voice commands in seven languages in extreme conditions.